So you all know I have an unhealthy obsession with the deliciousness that is sugar, and butter and everything else as such. You all also know how bad this stuff is for you and therefore can only be enjoyed in small quantities. Since that is not really an option for yours truly with a sweet tooth the size of Everest, I was so happy when I ran into low-carbs expert C.J over at Food Stories Blog. Unfortunately, I’m also a diabetic so I work very hard to moderate the amount of carbs that I eat while trying to focus on healthy, natural, unprocessed, whole foods. Whole foods & low carb can be a delicate balance but for me, it’s a way of life. Now, in all honesty, around the holidays it becomes much more difficult to eat right and I struggle with it. Working at a hospital makes it quite difficult because of the long hours with no breaks and all the food gifts from the patients and their families. Sometimes, I just throw up my hands and enjoy the seasonal fair. This biscotti certainly feels like a splurge but it can be made fairly balanced if you make it right. 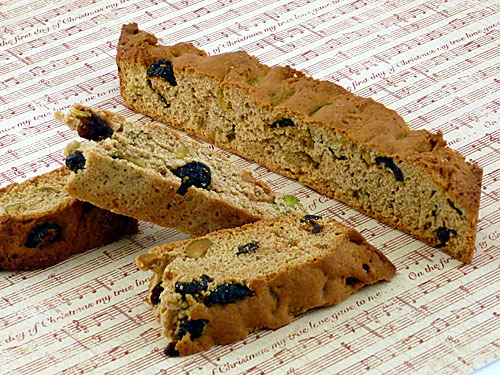 Since biscotti are very dry, they are traditionally served with a drink for dunking. In Italy they are typically served as an after-dinner dessert with a Tuscan fortified wine. Outside of Italy, they are more frequently accompanied by coffee or tea. I love coffee so it’s probably natural that I love biscotti. Up until now, I had only been a consumer but now I’m a biscotti baker. Uru’s blogging invitation really made me think about what I wanted to share and I immediately wondered if I could make biscotti. Really, it always looked so intimidating but it turned out to be very easy. When I do eat carbs from flour, I try to eat the healthiest one’s available so I was thrilled to learn that biscotti really lends itself to whole-wheat flour. The very first recipe I tried worked out great, which almost never happens in my world. The batch that you see here is only my second batch of biscotti and they turned out fabulous. This amazing whole grain recipe was adapted from Whole Grain Baking by King Arthur Flour. Lightly grease a baking sheet that’s at least 16 inches long. Mix in the baking powder, salt and vanilla. Add the eggs in one at a time, beating well after each addition and scraping down the sides of the bowl. Add the cranberries/pistachios and mix well. Scrape the dough onto the prepared baking sheet. Lightly wet your fingers and pat/smooth the dough into a log about 14 inches long by 2-1/2 inches wide and 3/4 inch thick. Bake for 25 minutes and remove from the oven. Reduce the oven temp to 325 degrees F (160 degrees C). Let the log cool about 15 minutes then cut into 3/4 inch slices with a serrated knife. 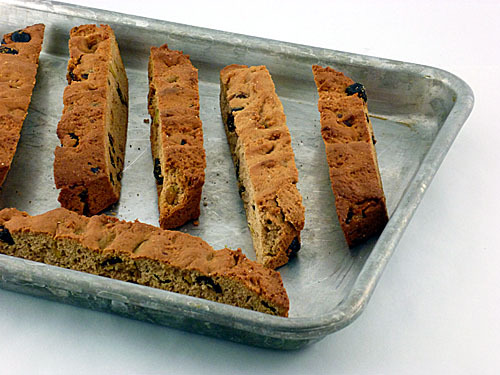 For longer biscotti, cut diagonal slices. 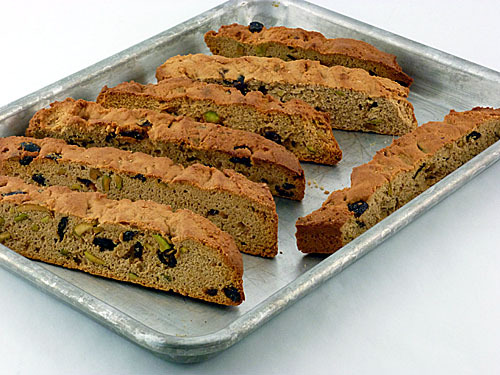 Arrange the slices upright on the baking sheet and return to the oven until biscotti are a very light, golden brown. About 20-30 minutes. Remove from the oven and let cool right on the pan. These keep well in an airtight container for about two weeks. Some sources say even longer! All I know is these are great for the holidays and for holiday gift gifting! I call these Double Chocolate Pistachio Biscotti and they were made with all the regular, full carb, chocolate-y ingredients that I knew she would like. Thank you so much C.J! Your guest post was chock full of goodies, C.J. — food history, creative photos (loved the one with The Twelve Days Of Christmas! 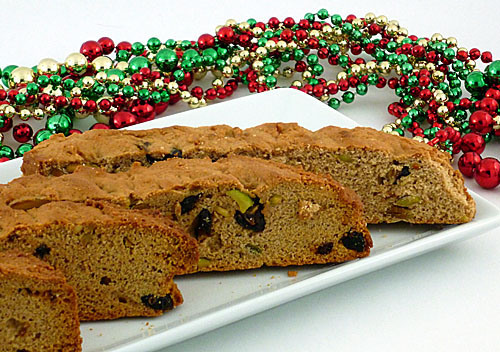 ), dietary adaptations & more — and then you topped it off with a chocolate biscotti version. 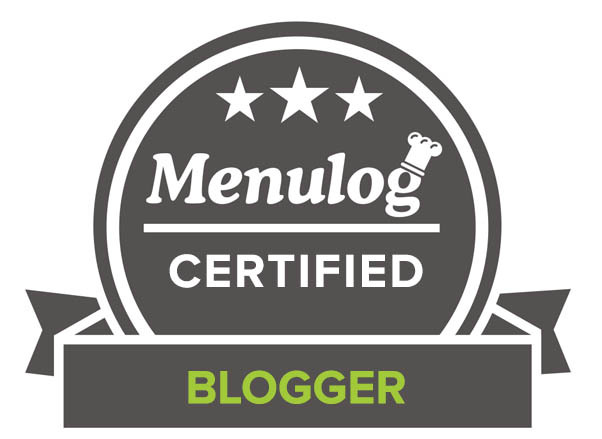 Many thanks for a terrific guest post! I love biscotti! What a great reminder to bake them again! These look so perfectly delicious!! Very nice! Thank you so much – Hope you’re having a great new year! Happy new year! lovely combination…. Thx for stopping byDeepti & Happy New Year! I prefer low carb, and these recipes sound lovely. 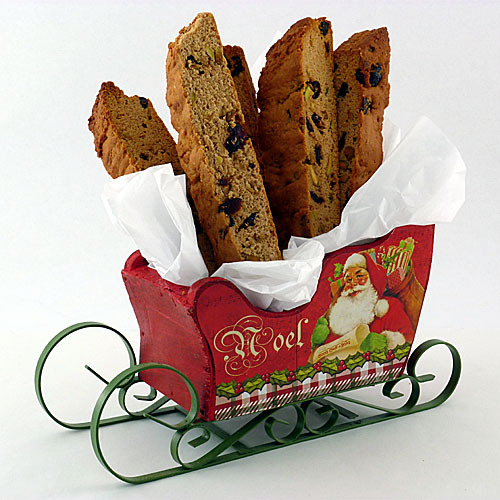 We didn’t get our gift of biscotti from our neighbour this year so I may have to break down and make these. I hope you love them, Eva – Our family really enjoyed these … Happy New Year! Lovely Guest post CJ!! Wish you a very happy New Year!! Thank you so much, Minnie – Happy New Year! 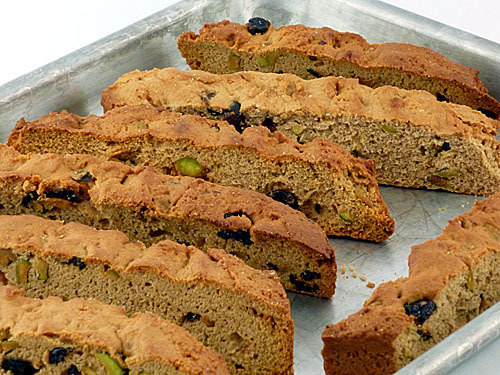 Very beautiful biscotti! I would love them with my mug of hot chocolate! Happy 2013 Uru! Thx for stopping by Katerina – Happy New Year! Yum! Love homemade biscotti. Happy New Year. Thank you, Dara – Happy New Year! Happy New Years!!! Enjoy the time with family. 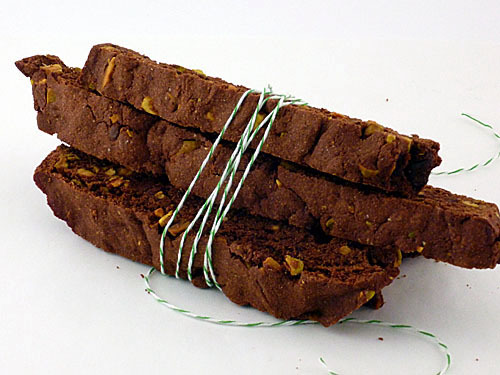 I love biscotti, especially with pistachios. This looks so good!! I love the pistachios….yummy!! Happy New Year!! Thank you Suzi – I really ramp up my pistachio baking in the fall – Happy New Year! I hope both you and CJ had a wonderful Christmas and New Years! 😀 I hope 2013 brings much fortune and success! Delicious looking biscotti, C.J., and I know CCU will love the chocolatized version. Happy New Year to both of you! Thank you, Kathleen – Happy New Year! Thank you and Happy New Year! Love the Biscotti. 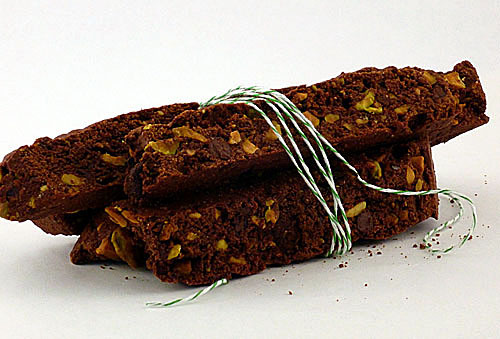 Especially the Double Chocolate Pistachio Biscotti !! Thx – It’s pretty darn tasty, if I do so say so, myself … Happy New Year! Yes, it would – Hope you’re having a great new year! Thanks for sharing, C.J.! 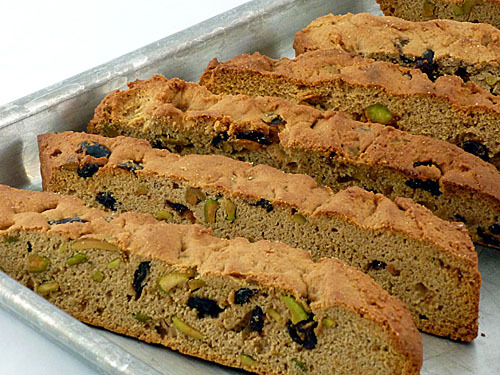 I love the healthier aspects of this biscotti. I’ve never made it before but yours look so perfect, I’m getting inspired 😉 Happy New Year to both you and Uru! 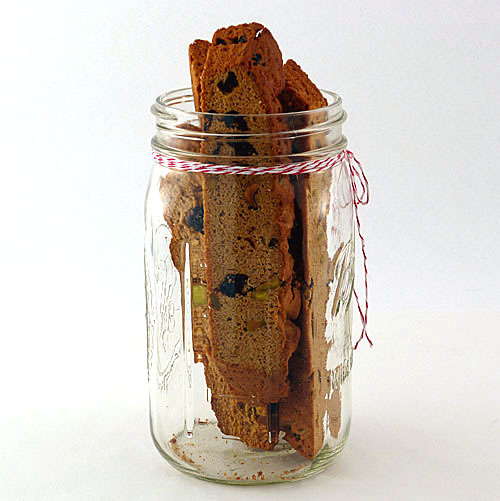 I have always loved these dry biscotti and recently tried some sugar and grain free ones and they turned out just as great though, I must admit, I was worried. It’s great to still be able to have sweet treats even if we have digestive issues. Happy New Year! That’s great to know – I may have to try my hand at these – Happy New Year! Oh, la laaaaaaaaaa. I must try! Thx so much for stopping by – Happy New Years! Beautiful!! All I need is a big, steaming cup of hot chocolate! Hot chocolate would go great with these & I know CCU would approve … Happy New Year! I am a huge fan of Italian cookies. These are for sure a keeper. Thank you, C.J. for sharing. I know you’ll love these, Angie … Have a happy new year! Happy New Year!!! These are wonderful. Thank you, Jaime – Happy New Year! Hello CJ and welcome. Both your biscotti recipes are very appetizing looking. The pistachio/cranberry colours are seasonal and would make a great tasty addition to a cookies and pastry gift basket or even just a mug filled with cocoa as would the chocolate version. I’m sure low carb diet planners appreciate having a treat like your biscotti around the holidays when everyone is indulging. Thank you so much – Happy New Year! One of my favorite food item, thanks for sharing.. Happy New Year! You’re so welcome, Norma – Thx for stopping by & Happy New Year! I suspect that a lot of people are going to be drastically reducing their carbs, at least for awhile, in the new year. So this is a timely recipe! Great guest post! Happy New Year! Wow, CJ! Those biscotti look great! Especially the cranberry pistachio one! Not that the chocolate one doesn’t, but it’s just all festive with the red cranberries and the green pistachios. 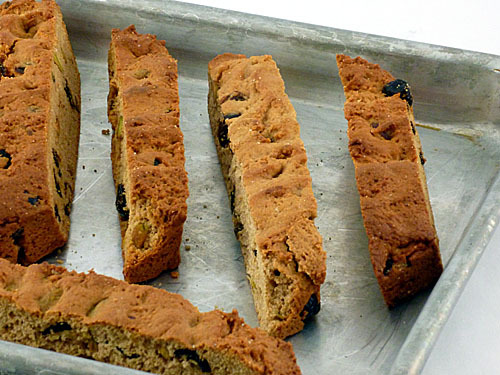 I think I need to try my hand at some biscotti! Uru – Thx so much for giving me the opportunity to share with your readers – I had great fun & hope you’re having a great time on your well-deserved break … Happy Holidays! Looks delicious! Have a Happy New Year!